ALIEN ABDUCTION! well, or maybe, something else? Posted April 24th, 2017 by Mike Boyes & filed under Consciousness, Group Processes, Memory, Personality, Social Psychology. Description: Apparently about half of people when surveyed will say they believe in the existence of Aliens (little green people, or at least of some colour or other). There are also quite a few people (in fact, 3.7 million Americans in one poll) who believe they have experienced some form of alien abduction. What hypotheses might we entertain with this data in hand? Well one possibility is that there really ARE aliens abducting (and returning) humans to earth (well to the United States at least as that is the only place we have poll data from) and, if the numbers are true those aliens a REALLY REALLY busy! 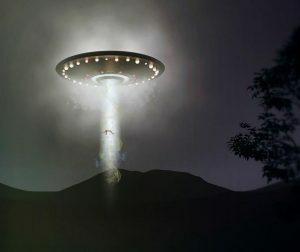 Now, if at least some or perhaps many, most or even ALL of the reported alien abductions and alien sightings do NOT involve aliens then how are we to explain them? THAT is certainly something psychology should have a thing or two to say about! Before turning you towards the linked article let me offer you a developmental hypothesis. Do you see a similarity between the two images below? A couple of aliens right? Well no, actually the picture on the left is what a mother’s face likely looks like to a new born infant (http://www.skeptic.com/reading_room/close-encounters-of-the-facial-kind ). I am NOT saying our mothers were all aliens. I am suggesting that the degree of similarity in what people who say they have seen aliens say they looked like might be due to them all drawing upon early, pre-representational (email me if you want a more detailed explanation of pre-representational) memories of their human mother’s faces. So, maybe there are psychological possibilities for how people have come to believe they have seen or even been abducted by aliens. Think about some possibilities and then read the article linked below to see what has been hypothesized from within psychology. Source: Some scientific explanations for alien abduction that aren’t so far out of this world, Ken Drinkwater and Neil Dagnall, Science, The Independent. So personality and suggestibility offer a possible way to talk about “memories” of many things including alien abduction that may be “real memories” but reflect events that did not actually occur. Throw sleep paralysis into the mix and you have more explanatory options. Again, I cannot say whether aliens exist or not and whether they are being seen by people on earth or whether they are regularly abducting people and later returning them to earth. I have no data to indicate that such claims are true or false. We DO, however, have some alternative hypotheses about how such stories could arise. Human psychology has room for memories of aliens even on the off chance that none of them have actually visited earth…. YET. Fascinating stuff! How might we account for the stories some people tell about alien sightings or alien abductions (of humans) without there needing to actually be aliens involved? What should we do about such possibilities? What other human experiences might be influenced by the sorts of psychological observations and hypotheses discussed in the linked article(s)? Clancy, S. A. (2009). Abducted: How people come to believe they were kidnapped by aliens. Harvard University Press.